Barclays Bank is one of the leading banks in the world with operations in 60 international countries. The current financial crisis has caused serious problems for financial institutions, and Barclays is no exception. The recent fiasco has thus strengthened the argument that there must be a more comprehensive corporate governance code for the financial institutions. (Kalbers, 2009). Barclays therefore has to prepare itself for the relatively new and more radical changes that may take place in future in terms of new corporate governance challenges. Historically, it has been observed that the Britain’s Corporate Governance movement has been hijacked by top accountancy firms in order to maximize value for shareholders; other stakeholders, such as employees, customers and the community, have been relatively neglected. (Cassidy, 2003). Today’s environment is relatively more volatile than beforehand due to perceived threats to the global financial system specially in the aftermath of the current financial crisis. It is critical to note that in such an environment, the overall competitive pressures are mounting on many financial institutions including Barclays to maintain their positions within the market. Of great significance is that the current financial crisis has resulted in the decline of loanable funds to the consumers; this will likely result in a drastic decrease in revenue as well as profitability for Barclays Bank. The recent results however, indicate that the firm has been able to withstand pressures and the results of the first half of 2009 has shown considerable improvement by the bank. One of the most important challenges faced by the Barclays Bank is to keep its dominance over its traditional markets. Though the bank has been able to meet the current global financial crises however, its ability to service the market has reduced due to overall external economic conditions. Firm therefore needs to revise its internal control mechanism in such a manner that it successful withstands external challenges. The new capital requirements under BASEL II are another significant challenge because it will require Barclays to manage and maintain a certain level of capital against its assets. Similarly, the collective malpractices in financial system as a whole is another significant challenge because banks have indulged themselves into activities which Customer services is another significant challenge in such scenario where profits are declining and expectations are rising for more efficient customer services. In order to cope with the increased pressures of the financial crises, Bank of England has significantly lowered the interest rates whereas the overall cost structure of the banks have remained the same which therefore resulted into lose profitability for the banks. This also indicates the UK’s financial institutions are still finding it hard to achieve a balance between risk and reward and subsequent development of corporate governance mechanisms which can help achieve organizations this aim. (Gentle, 2009). In order to overcome these strategic challenges, Barclays has to strengthen its internal controls and procedures. The non-existence of checks and balances on the activities of the managers provide incentives to the managers to engage into such activities which are potentially not in favor of all stakeholders. The overall focus shall therefore be on ensuring complete and more transparent reporting of the all issues of the bank while at the same time implementing an effective corporate governance code by strengthening the role of various other stakeholders. So Shall We Write Your Assignment Too? We’ve done it for thousands of students, and they are thankful and satisfied. 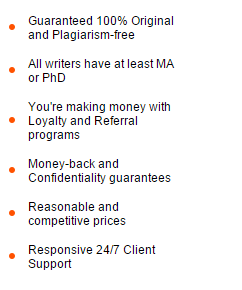 Since you’ve been reading all this, you most probably want to pay someone to do your assignment. Trust us; that someone is our company! Open your account and place order now.